I made this soup Monday evening for dinner. It was after I had made a crisp ( to be posted about later this week) and was feeling like I needed to make something more , ah-hem, healthy to exist on. Monday was my day off/pay off for working the weekend. I find it to be a fair trade. I didn’t have anything planned beyond running ( umm…that marathon is LESS THAN A MONTH AWAY! ), haircut/trim/got-my-bangs-back-that-were-no-longer-bangs, and puttering around the kitchen…all completed, just not necessarily in that order. OH, and a total un-necessary, necessary trip to Target. A little retail therapy if you will. Once home and coming off my caffeine buzz – I am sucked into Starbucks in the front of Target each and every time. I don’t even try to resist anymore, I just get in line. Any who… I realized I needed actual food for dinner…besides the crisp. Something healthy, yet substantial. With a bit of green, because I hadn’t any veggies all day…and yes, I try to get some sort of green into my body each and every day. Also, it needed to last a few days…you know, easy lunches all week are a total requirement for any meal I make. Therefore, soup is what I came up with. Real original right? I just love the stuff. And if I am adding requirements to lists…then I might as well add one to my list of requirements in the dude department. They must LOVE soups, or at least enjoy them from time to time. And by time to time I mean at least once a week. Otherwise, they might end up hungry or fending for themselves. 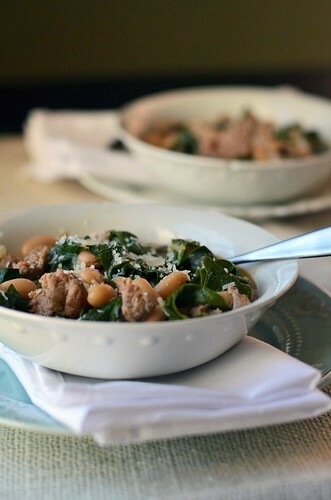 As you can guess, this soup contains sausage, beans, and swiss chard. 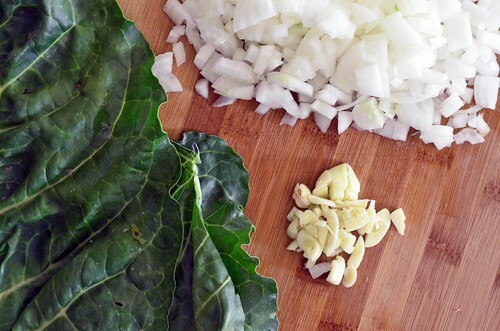 I was a bit hesitant to toss in swiss chard because I was afraid it would get slimy…but thankfully it doesn’t. What a relief! I prefer thick soups or creamy soups and while this one has a bit of broth, it is chunky….which is a trade-off I can deal with. Brothy soups are for those that are sick and ailing. I need substance if the soup is going to be the main dish. 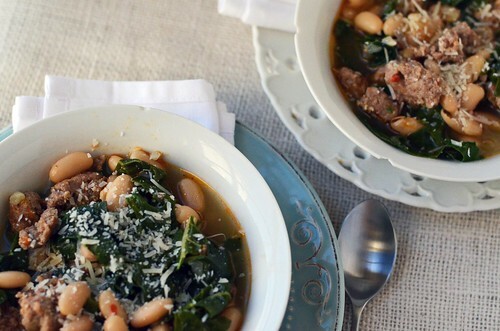 Substantial is this soup’s middle name. P.S. Check this out…had me giggling all day long. In a large pot/dutch oven, heat the olive oil over medium-high heat. Add onion and garlic with a pinch of salt and cook until onions are soft and translucent. 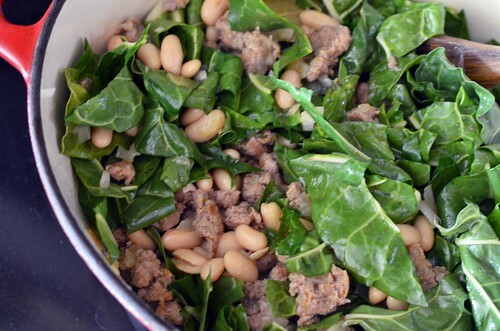 Add sausage and continue to cook until the sausage is browned and cooked through (7-10 minutes). Use a wooden spoon to break up the sausage into bit size pieces. 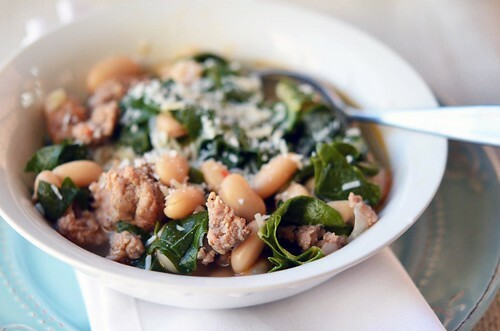 Once the sausage is cooked through, add beans, chicken broth, and swiss chard. Stir to combine, scrapping the bottom of the pan to get all the sausage tidbits. Bring soup to a boil and then reduce to simmer and let simmer for about 10 minutes. Remove from heat and serve immediately. Top with parmesan cheese.